Now-a-days All the Webmasters are busy in creating the valuable backlinks to their blogs due to the upcoming Google page rank update. Last page rank update was held on 2nd August 2012 by this the next page rank update was expected in this month. so most of the blog owners are concentrating on creating useful backlinks. Most people create backlinks by linking their website in social networking sites. But most of the social networking sites are offering no-follow backlinks which doesn't pass any page rank juice. Pinterest is a well known social networking site. Recently It Introduces Website verification functionality to profile pages. 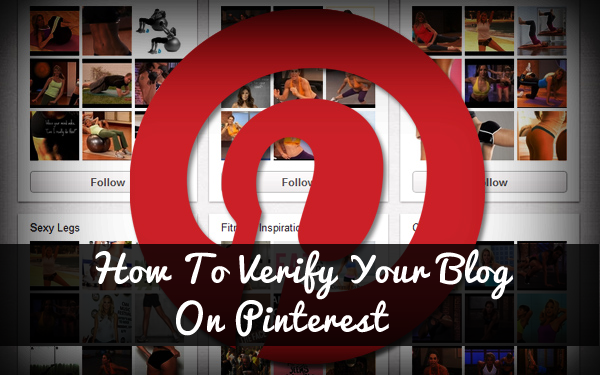 By verifying your Blog on Pinterest you will get a do-follow backlink. To verify your blog in Pinterest will need a web Hosting But Now a Simple way to verify the website without having a web hosting is found. 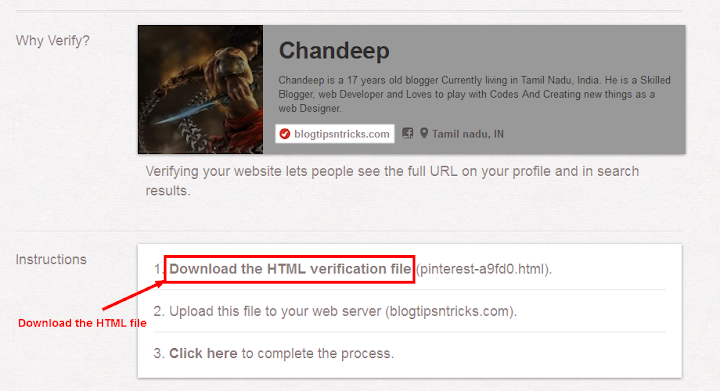 Let's see how to verify a blogger blog on pinterest without using web hosting. To verify your blog on pinterest you must have a pinterest account If you do not have one. Then you should register a new one. After Creating An account on pinterest follow the steps given below. Go to Pinterest.com and Login into your Account. Now scroll down and look for a Text area i.e. “Website”. Once you find it type your website URL and press the “Verify Website” button. (Note: Type the URL of the website correctly). After clicking the "Verify Button" you can see the instruction page as shown in the below image. In that page Download the HTML verification file. Now open a new tab in your browser and log in to your blogger blog then go to Blogger dashboard >> Pages >> Click on 'New Page' button. Now Open the HTML file that you have downloaded from Pinteret in a Notepad. Copy all content of the notepad and paste the content as 'body' of the new page. Give the exact name of the HTML file to the 'Page Title'. See the image. Now save the new page and click on 'Publish' button to publish the new page for verification. Now copy the URL of the new page. It should be something like this. The expected url should be look like this. Now We have to redirect the page url to the Pinterest expected Url. To Redirect the page Follow the steps given below. Go to Blogger Dashboard >> Settings >> Search Preferences >> Errors and Redirection >> Custom Redirects >> Edit. Now We are going to Create a Custom Redirect From the "Expected Pinterest URL" to the "Page created by us". You can see the Image below for better understanding. Now follow the steps Given below to create the redirect. Enter URL of the newly created page in the 'To' field. like this. NOTE:- Remove the First part of the Url i.e "blogtipsntricks.com/p/pinterest-a9fd0.html" is the URL then Remove "blogtipsntricks.com". Select the option 'permanent' and 'Save' the redirection. Save the settings and now follow the verification procedure at 'Pinterest Profile'. That's all. Now You have now verified blogger blog on your Pinterest profile. NOTE:- Your addresses (URLS) may be differ from the given addresses in this article (i.e./pinterest-a9fd0.html) but the procedure is same. I hope this trick will help you and ALL THE BEST to get a better pagerank in the upcoming Google Pagerank Update. Share your Precious comment about this article and also don't forget to share this article in social Networks to spread the Knowledge. I'm Glad you like it. You're welcome. I do not need to copy anyone's content and even I haven't seen this site before. So I did not copy this article. You can check copyscape or DMCA scan to verify it. Nice work!! I have shared this one on my Google+ page. Thanks for sharing the steps for Blogger blog owners to get their blogs claimed on Pinterest too. Wow , brilliant observation and steps, I really salute you brother . It is called real blogging tutorial. Shazida Khatun is a woman as I know her personally , so she is sister , not brother .However excellent tutorial for bloggers , thanks for the share. Please explain. You can find the verify button on settings page. Hi Chandeep, can you tell me how to do the same for WordPress ? My site address is www.geekyparigyan.com . Tell me about the redirection thingy..